Black Water Rising, by Attica Locke. 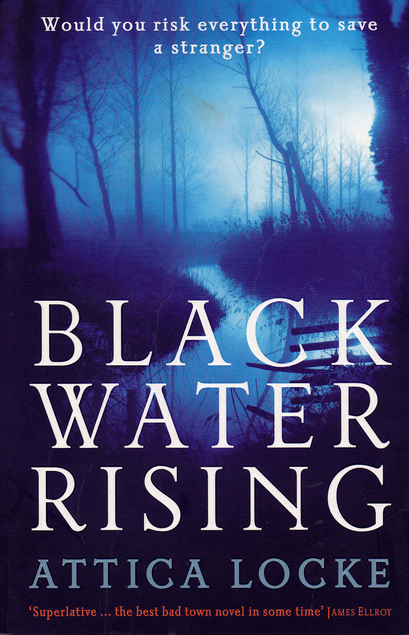 Black Water Rising, by Attica Locke. New York : HarperCollins, 2009. A complex and powerful mystery which probes the meaning of race and power in an individual and in a city during the years after the civil rights movement in Houston. Attica Locke is a black woman who uses the mystery genre as a lens for revealing how the public and political play out in the private lives. Her skill as a writer shows in her ability to interweave the various threads of her tale into a coherent whole centering on a few weeks in the life of Jay Porter, a young black lawyer. In the process she never loses the fast action that push us to read mystery stories. When Jay recuses a woman about to drown in a Houston bayou, he gets pulled into a murder case that could destroy the life he has carefully assembled after a brush with the law during the Civil Rights Movement. Flashbacks fill in the events of the past which continue to haunt him as he tries to figure out what is threatening him and his pregnant wife in the present. The internal wall he had built to protect himself fails. As dangers mount, Jay finds himself realizing that he must move through and beyond his greatest fears. His story is so compelling that I found myself reconsidering some of my own deep fears. Locke is a native of Houston, the city which provides the context for her narrative. The actual names of wards and subdivisions, streets and bayous, make the story very real. Houston more than a backdrop for the novel, however; it is a city which has an almost mythical status for its oil money and abuses of power. It is also a southern city where prejudice against blacks has died hard. Locke shows readers what Houston was like in its boom years of the 1980s, and we learn of the local activities of the civil rights movement in Houston in the previous decade. While I have never known Houston as Locke has, the stories she tells of what happened there are confirmed by what was happening nationally in those years. The infiltration of protester organizations and the violence used against them by the police and FBI are well documented. Jay Porter was not being paranoid; he had very legitimate reasons for his fears. In some ways, Locke gives us a more detailed and nuanced picture of activism in the US in the 60s and 70s, than Marge Piercy does in her book, Vida. The greed and racism that Locke shows us acting in Houston are factors that have shaped and continue to shape the characters in Locke’s novel. Race, rather than gender, is the prominent issue here, but the book is studded with interesting women, some of whom hold status positions that used to be the sole dominion of men. We have to ask what has and has not changed. Jay’s wife, Bernadine, is particularly well-drawn as a woman not easily brushed aside by her husband’s risky secrets. She is a woman caught between her love for her husband and the needs of her unborn child. Black Water Rising is an excellent mystery, but more importantly, it reveals the ugly ways in which racism and greed have continued after the Civil Rights movement, not just in Houston, but in the American nation and worldwide. I heartily recommend this book to all readers who like mystery and suspense combined with insightful depictions of characters and attention to critical public and private issues with which remain unresolved today. And to all interested race relations and civil rights in America. I am off to find a copy of Locke’s latest novel.